I've been thinking about the six St. Anthony's Quilters all winter. 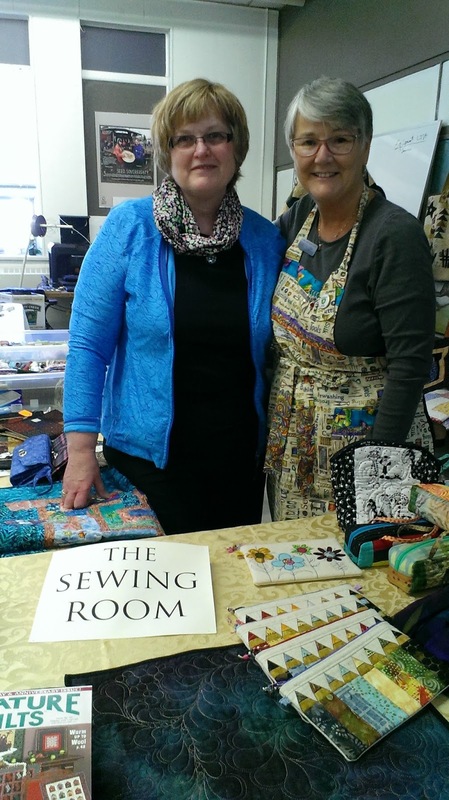 They've been meeting every Wednesday at the church working on the Blue Bell quilt. While they are hand quilting around the frame, the choir practices their wonderful music. Half way through the afternoon, they break for tea and a sweet snack. They love the social visit as you can imagine and it's a great activity to drag you out through the winter. I have been planning a visit with them ever since we got home... I wanted to bring them something. After some thought, I decided to make them each a little pouch, which is one of my new favorite small projects. I've been working on them all week and my new sewing machine is getting quite the workout. I've added some beads for the zipper pulls to give a bit of sparkle. 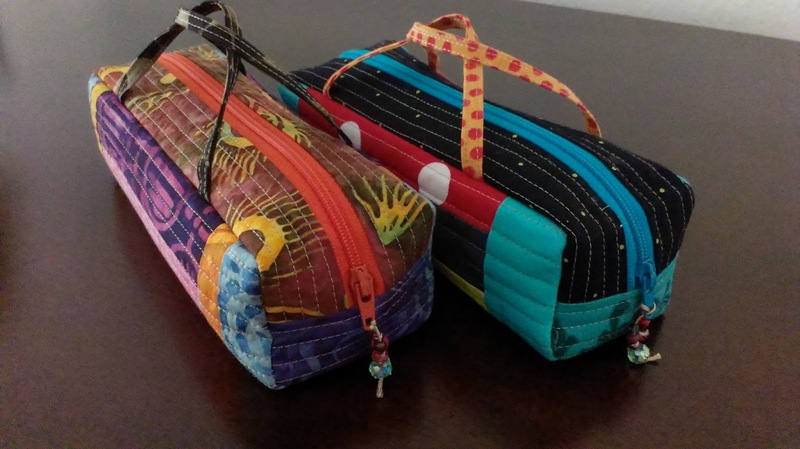 The girls all carry their hand quilting supplies in various containers, but now, they can carry them in one of these stylish but cute batik quilted bags. I had my visit with them yesterday. They loved them! We've been home for almost a week. While it's nice to be home, it's a bit overwhelming getting back into the swing of things. But we are in the groove now. One thing I was really looking forward to getting home to, was a new sewing machine. This sewing machine will replace my old Pfaff embroidery machine. I've been testing it and playing with the machine and the software. I'm trying different stitches on it, and I can see I'm going to love it. It has a bigger throat, and an additional bright light in that will be appreciated. 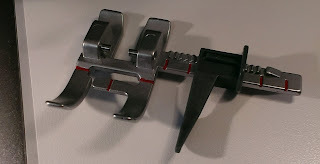 One thing that was noticeable immediately, was that there was no manual presser foot lift. 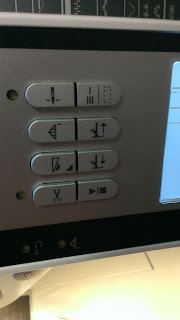 You have to press a button to lift it. I see this on many newer machines now. After sewing an hour on my new machine, I can see that it's something that can be overcome and I'll get used to it quickly. 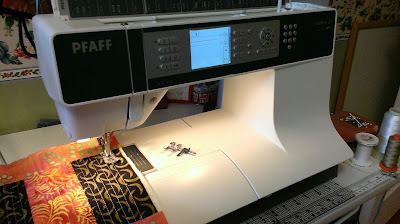 This weekend, I'll try the embroidery function of my new Pfaff Creative. 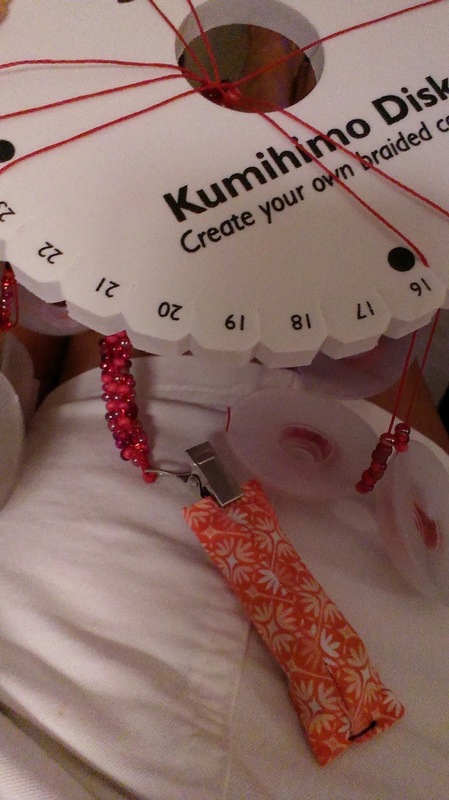 I have a cute sewing themed design, that I'll test with. Stay tuned! I learned from my mistake last year. I packed up way to early. 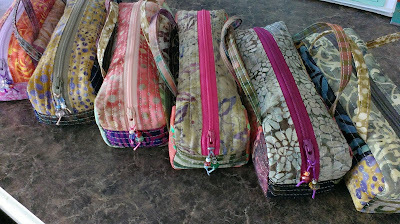 I recall feeling the need to sew for a few more days after packing up. So this year, I gave myself those extra few extra days of sewing. I cut up some batik scraps to make these three cute pencil pencil cases. 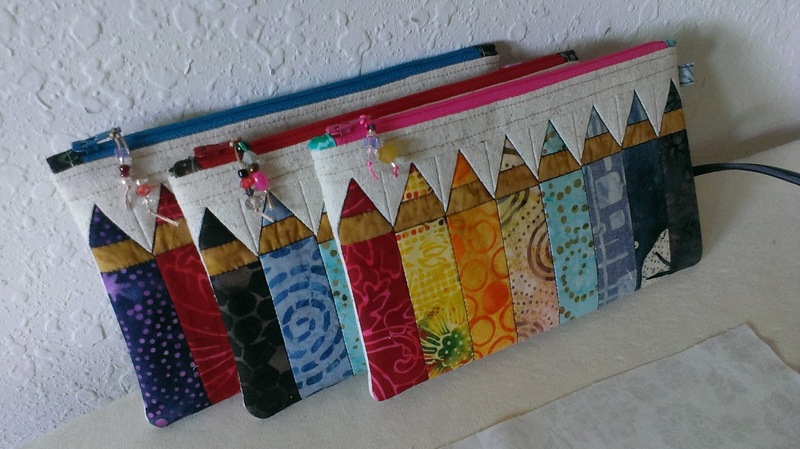 It's fun to put together the colors, and I added beaded zipper pulls for extra cuteness. They all have their own look. And I also simplified this little project I made in early January. Made two more with scraps. One with the last few of my Oh Canada quilt scraps. Do you recognize the red fabric with the white dots Jeannie-Kaye?. And the other one is made with batik leftovers from making wallets for my sister. 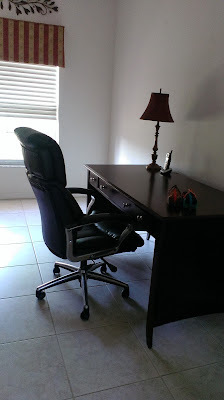 And, now, within an hour of finishing sewing, my sewing den is packed up and put back to the way it was when we got here in December. Looks so empty!!! Now I'm ready to go home. And I can hardly wait to get there to see my kids and grandkids.... and of course reacquaint myself with my stash. It's been a great four months. I always think of the words of grand daughter Jessica when she was small. She used to say, "When it's time to go, it's time to go!". And it's true. I really enjoyed making my first Kumihimo bracelet. This was a kit from Beadaholique. 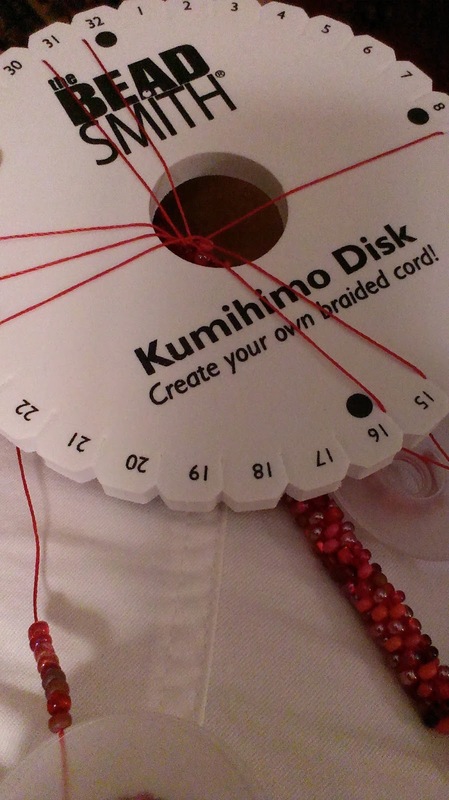 They sent the braiding cord, beads, a spiral clasp and instructions. I've strung the eight strands of cord. 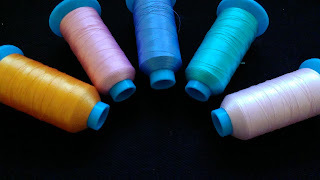 And wound them on the bobbins. Now I'm all set to braid as I watch TV. I'm surprised at how quick the braiding goes. After about an hour, I have 7 inches of the beaded braid done. While watching the video to make the bracelet, they recommend to clip a weight to the braid. 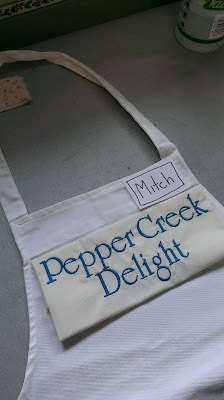 I didn't have one, so sewed a little bag, slipped 20 pennies in it, and attached this little curtain clip to it. Worked perfectly for me. Good thing I'm doing this in the USA, because as you know, pennies are scarce now at home. And Voila. 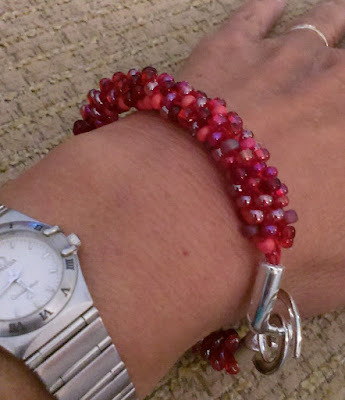 I'm pleased to show you my bracelet. I've worn it for the past few days and gotten lots of compliments on it. 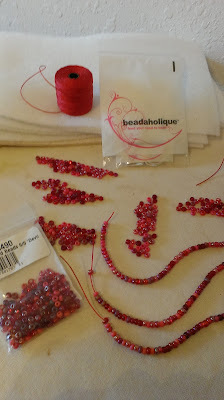 Now, it's all the rage here in the community and I know these beaders love to have a fresh catch. Well, they caught me. Now, on to stringing beads for my trip-home project in the car. It's been a year or so since I made a take-along bag by Lazy Girl designs. 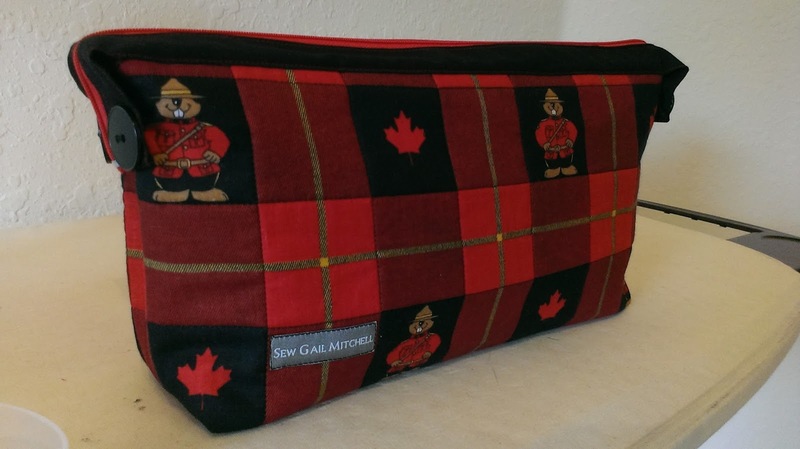 Our time is closing in on us here in Florida and as a little thank-you gift to our awesome neighbour, Bob from Ontario, I made him this Canadian version of a take along bag. He has helped us out in so many ways, and he is a super volunteer here in our community. I made this bag totally from memory. I pleased that I remembered most of the measurements. Now ask me what I had for supper yesterday, and you'll probably get a blank stare!! Leaving for the great North in a week from today.